Rosacea is a chronic, inflammatory skin condition which principally affects the face, and causes skin redness. Rosacea is a chronic, inflammatory skin condition which principally affects the face. 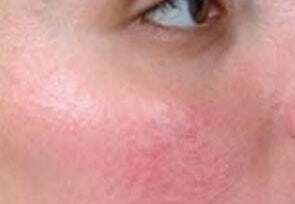 Rosacea has a variety of triggers. However, it is not known what causes the condition to start in the first place. Rosacea causes skin redness, and its symptoms often begin with episodes of flushing. But other symptom such as burning and stinging sensations, pustules, visible thin blood veins can develop when the conditions getting worRosacea causes skin redness, and its symptoms often begin with episodes of flushing. But other symptom such as burning and stinging sensations, pustules, visible thin blood veins can develop when the conditions getting worse. Symptoms can come and go. Rosacea can’t always be prevented, however, triggers can be avoided where possible. It is best to speak to a highly trained Premier Laser & Skin consultant who can advise on the best course of action for you. Symptoms include facial flushing when exposed to changes in the environment which can range from slight to intense redness. 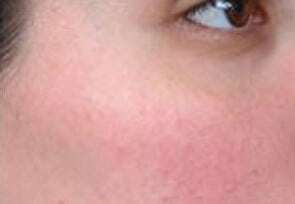 Rosacea sometimes shows as raised red bumps on the face.